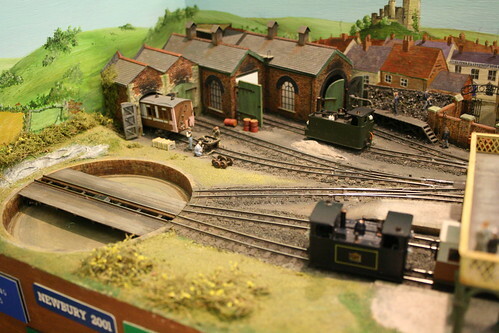 For the last couple of years I’ve been a member of the Sussex Downs group of the 009 Society, and had a few opportunities to operate parts of the club layout – the Upsands Downs and Evaleight Light Railway. 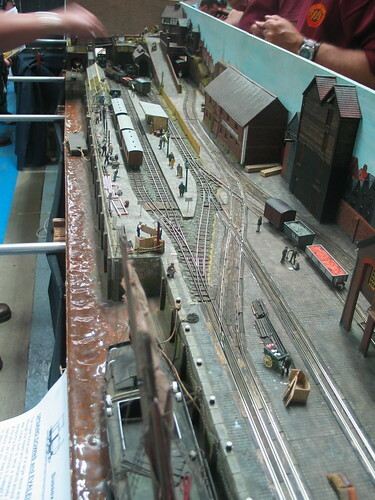 Set in the Kent/Sussex borders during the 1930s, the layout has been under continuous development for the past 25 years and represents a bustling common carrier railway passing through attractive and varied scenery. Fully assembled it’s an impressive beast, requiring a large team to run the timetable, but it’s modular nature means we can (and usually do!) exhibit with one of a number of smaller configurations. However I’ve now captured the complete layout on camera, so I can present an end-to-end guide to the ELR. … the Brickworks, which was inspired by a visit to a working site in Sussex. 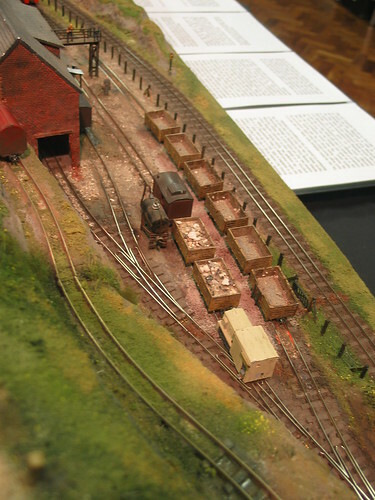 Here, trains of clay are delivered from further up the line and shunted in to the works. Hidden sidings swap the full clay wagons for empties and also supply loads of finished brick for onward transport. Just beyond the works, the grand entrance to Etheridge Towers sits above one of the tunnel sections which allows the attachment of the main fiddle yard in different positions depending on the layout configuration. Emerging from the tunnel the main line continues over a viaduct, which spans a canal and a disused standard gauge railway. Turning another corner after the viaduct, we come to the passing loop at Wharf Cut. Here, the canal has risen to meet the railway and there are interchange facilities. You might spot a bit of “damage” on one of the station nameboards, this is just one of the puns and cameos that help to fill the layout with life. Shortly after Wharf Cut the line arrives at Gryndene Quarry, which supplies the clay for the brickworks back at Evaleight. Again, wagons can be shunted here and empties are exchanged for full ones under the hilly terrain. Adjacent to the quarry is Gryndene Halt, which acts as a simple junction to again connect to the fiddle yard. Interestingly(?) this photo has somehow been adopted as the illustration for 009 on Wikipedia! After a final short tunnel the railway arrives at the second terminus, Upsands Quay. As well as the dock there is also interchange here with a standard gauge line and some mixed gauge track inlaid in the quayside. Improvement works are also ongoing, with a new station canopy under construction. Although the two terminii are not physically connected, by now we have made a full circuit of the baseboards giving a layout which can be viewed on all four sides in its largest configuration. As a recent member of the group, I can’t take any credit at all for the many years of effort that have gone in to the construction of the ELR, but I have enjoyed my outings to operate it. Hopefully you’ve also enjoyed the tour! The Sussex Downs group will be holding a Member’s Day in Haywards Heath in March 2009. Layouts attending are to be confirmed, but I’ll post more details closer to the time. 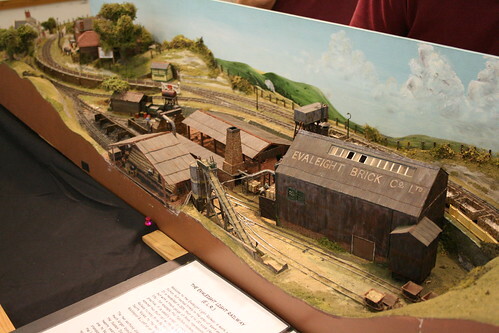 This entry was posted in 009, evaleight, exhibition, layout, model railways, narrow gauge, photos. Bookmark the permalink. 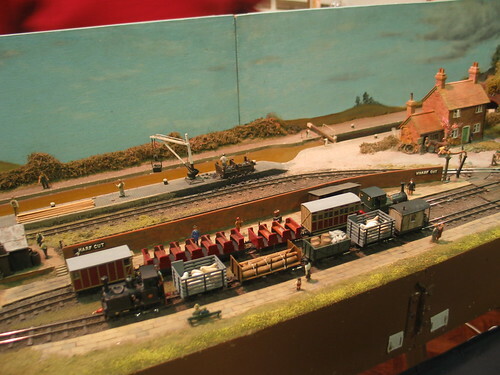 I wonder if the Sussex Downs group would like to exhibit at this year’s Tinkers Park Rail Gala? Also I am planning a model brick/tile works in 7mm scale NG (0: 14) I took some pictures of the Evaleight brickworks when it was at the park but could you tell me more about the buidings. For instance what type of kiln is it?